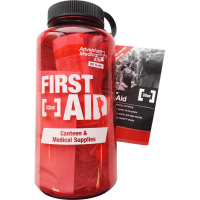 Stock your hiking or travel first-aid kit with the Adventure Medical Kits 1 in. x 10 yd. tape refill, and be prepared for any situation that may arise. 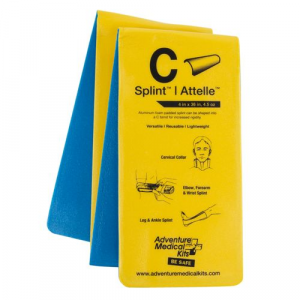 Prepare your first-aid kit for your next adventure by stocking it with the Adventure Medical Kits 4 in. elastic bandage refill for the proper care of wounds, sprains and strains. Keep the items you need for common cuts and wounds within easy reach by adding the Adventure Medical Kits adhesive bandages refill to your hiking or travel first-aid kit. Whether you're playing in the backyard or hiking the trails, the Adventure Medical Kits ADS Dog Heeler first-aid kit is compact enough to go wherever you and your buddy roam. Because they love the freedom of the trail as much as you do, Adventure Medical Kits ADS Me And My Dog kit has comprehensive first-aid solutions to help both you and your four-legged hiking buddy. The Adventure Medical Kits ADS Trail Dog first aid kit gives you comprehensive dog-specific medical solutions for your trail buddy. An essential part of any first aid or emergency kit, the Z-Medica 25g QuikClot(R) Advanced clotting sponge helps stop moderate to severe bleeding until further medical help is available. A must for any first aid or emergency kit, the 50g QuikClot(R) Advanced clotting sponge from Z-Medica stops moderate to severe bleeding until further medical help is available.